Disruptive technologies are influencing the demand for skills in many occupations. 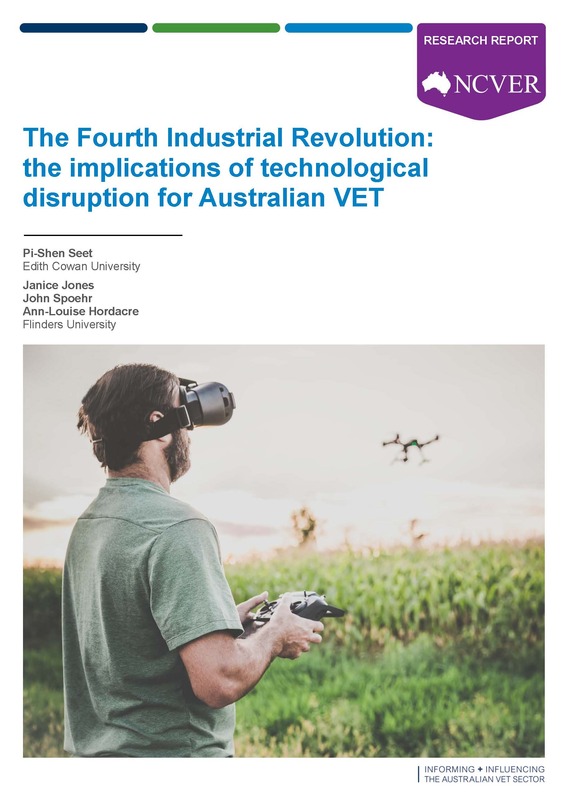 This report provides insights into the potential implications for vocational education and training (VET) of ‘disruptive technologies’ associated with Industry 4.0 from the perspective of industry (technology users) and innovators (technology producers). The research found that there are barriers that prevent VET from better developing the skills required for disruptive technologies. These include: the lack of integration between the VET and higher education sectors; resourcing constraints and continual restructuring with the VET sector; and the limitations of training packages. Much discussion has occurred about the impact that technological disruption will have on the Australian workforce. A recent paper by the National Centre for Vocational Education Research (NCVER), Skilling for tomorrow (Payton 2017), examines the various ways by which the growth in technological advance is reshaping the labour market, workforce and jobs.Despite uncertainty about the scale and nature of the effect, there is a growing consensus that Australia’s tertiary education system needs to change to meet the requirements of a future labour force focused on innovation and creativity. This research examines the relationship between emerging ─ or disruptive ─ technologies and the skills required, with a focus on the anticipated necessary skills from the perspective of both the innovators (technology producers) and industry (technology users). In this research the term ‘disruptive technologies’ refers to large-scale technology/market changes occurring through technological advances such as automation, advanced robotics and virtualisation. The research finds that disruptive technologies are influencing the demand for both technical and soft skills in many occupations, with some skills in decline and others in higher demand. The impacts of disruptive technologies on firms are likely to differ according to firm size, stage of development, and their capability and capacity to innovate. The effects will also differ depending on the purpose for which the disruptive technologies have been introduced. The demand for digital skills is expected to rise. Larger firms use in-house training to help fill gaps, including those identified in vocational education and training (VET) courses. Smaller firms, however, tend to hire workers with the required skill set, demonstrating the importance of the VET and higher education sectors in adequately skilling workers for digital disruption. Specialist technology-related skills are, unsurprisingly, important to disruptive technologies. However, generic non-technical skills, such as teamwork, problem-solving, continuous learning and creativity are also integral to the uptake and implementation of disruptive technologies in the workplace. Firms in this study view university graduates with technology-related skills, particularly higher-level technological skills, as more valuable than employees with VET qualifications. This probably reflects the sectors in which the firms are concentrated. - the limitations of training packages, impeding the flexibility of training to respond to rapidly changing disruptive technologies. The Industry 4.0 Industry Reference Committee (IRC), recently announced, will help to ensure that vocational education provides students with the future-focused skills they will need as a consequence of increased automation and digitalisation in the workplace, demonstrating that some steps are already being made to address some of the issues highlighted in this research. Technological innovation is seen as an engine for sustainable economic development and a driver of productivity growth. It is also widely accepted that the disruptive impacts of technology are amplified by their interaction with each other in the so-called ‘Fourth Industrial Revolution’ (Industry 4.0 or i4.0). Collectively, this has important implications for employment and training, particularly the demand for specific skills and capabilities. The extent to which advanced technologies and business-model innovation are more disruptive than the changes that have taken place during previous periods of technological and economic change is a subject of considerable debate. At the centre of this are widely divergent views about the potential impact of automation and artificial intelligence on occupational and skills demand. The focus of this report is to provide insights into the potential implications for vocational education and training (VET) of the ‘disruptive technologies’ associated with Industry 4.0 from the perspective of industry (technology users) and innovators (technology producers). Here, the term ‘disruptive technologies’ refers to large-scale technology/market changes as a consequence of technological advances such as automation, advanced robotics and virtualisation. - Swinburne University’s Advanced Manufacturing and Design Centre or Factory of the Future Testlab: an overview of an Industry 4.0 apprenticeship. Disruptive technologies are influencing the demand for skills and capabilities in many occupations, with a decline in demand in some skills linked to routine tasks, and a growth in demand for knowledge and skills linked to the development of the digital economy. The research found that the adoption of disruptive technologies has changed the nature of some existing jobs and in doing so has expanded the range of tasks, such as problem-solving and collaboration, creating the need for additional skills and knowledge. The Industry 4.0 agenda sees an accelerating digitalisation and the consequent demand for digital knowledge, skills and capabilities. While some skills, and the education and training that sustains them, will be rendered obsolete, the demand for digital skills and capabilities is expected to rise sharply, requiring education and training providers to adjust program offerings to meet this demand. This, however, may be limited by the content of training packages. While larger firms implement in-house training to help fill gaps, including those that exist in VET courses, smaller firms tend to hire workers with the required skill set. Specialist technology-related skills are important to disruptive technologies, especially in information technology and advanced manufacturing firms, which seek employees from a range of engineering (for example, design, electronics and electrical, mechatronics, mechanical and chemical) and computer science/software development disciplines. Firms in the study viewed university graduates with technology-related skills, particularly higher-level technological skills, as more valuable than employees with VET qualifications. This probably reflected the engineering and computer science sectors in which the selected firms were concentrated. Employers emphasised the importance of generic non-technical skills and competencies, reflected in employees whose skills and knowledge went beyond utilising technology per se, to include teamworking, creativity and problem-solving to explore and deploy technologies effectively in workplaces. There appears to be consensus among technology innovators and employers on the need to enhance skill development for disruptive technology, with skill needs varying according to the nature of the technology. However, when considering specific technologies, there is substantial uncertainty about the skills needed and how the training should be delivered. Sometimes the drive to train for the use of disruptive technology does not come from industry or the VET sector, but from the students themselves. For example, drone technology (which is now more accessible due to lower costs) has become quite ubiquitous among hobbyists, resulting in its adoption in a VET sector course. While there was consensus amongst employers on the importance of science, technology, engineering and mathematics (STEM) skills development, employers believe that, in general, employees lack the necessary STEM skills. This then adversely impacts on their ability to develop the required technical skills and complete their training, including their ability to successfully complete apprenticeships. In the VET sector, reduced resourcing, organisational changes and policy uncertainty, combined with the limitations of training packages, resulted in many VET trainers perceiving that they lacked capacity in terms of preparing themselves and their students for disruptive technologies. VET sector staff engaged in program development and teaching also pointed to training packages as a significant barrier to enabling them to train and prepare students for disruptive technologies. Interviewees described how the prescriptive nature of training packages limits their ability to introduce new elements into their training. This finding is also reflected in the fact that some employers reported difficulties in finding public and/or private providers with the capacity to provide education and training in specific disruptive technologies. The implementation of disruptive technologies such as automation, advanced robotics and simulation/virtualisation at the firm level is impacting on the demand for skills and capabilities, particularly those that enable digitalisation, while reducing or eliminating tasks that might be displaced by technologies. While the scale of the job losses caused by disruptive technologies has been greatly debated, it is widely accepted that these technologies will have significant impacts on the demand for particular skills and capabilities and, consequently, on the VET sector. Given that emerging disruptive technologies will change the nature of existing jobs, training solutions should be developed that allow for the expanded scope of tasks in existing jobs/roles/positions, with an increase in the range of knowledge and skills with which job holders need to be equipped in order to utilise these technologies. Besides developing technical skills and knowledge relevant to disruptive technologies, it is equally important to enhance the development of ‘generic’ or soft skills, as these are essential for preparing workers to be flexible and to cope with the rapid changes in the future workplace as a result of disruptive technologies. The disruptive nature of some advanced technologies has implications for the demand for skills, course content, and the knowledge and skills of the VET workforce, all of which have implications for VET planning, offerings and delivery. To better manage the ongoing changes introduced by disruptive technologies, the VET sector and employers need to work together to support the updating and upgrading of the lifelong learning skills of VET graduates. Disruptive technology, particularly pervasive digitalisation, is eroding the traditional boundaries between jobs. Recent moves towards developing cross-industry units, skill sets and qualifications, and their adoption across multiple industries, will help to address this. This approach needs to be accelerated.